21st Century Fluency Institute from Fluency21 on Vimeo. The 21st Century Fluency Project is an organisation dedicated to improving education. Central to their vision is their focus on the development of what Lee Crockett, seen above in the video, calls the critical skills students need in the 21st Century to succeed. The organisation has developed these 6 major Fluencies in responses to questions asked by all interested in the education of our children. Media Fluency – communicating learning not just in writing and in speech as we have been accustomed but also in multiple multimedia formats, the communication forms of the present and future. These are big concepts and challenge a lot of teachers today. For school administrators and experienced teachers currently involved in leadership, these are ideas that were never really explored back in our training days or years in the classroom. Some of these ideas may be beyond our comprehension or comfort level. What I am excited about with what Crockett is “selling” in this video is that the 21st Century Fluency Project’s solution goes far beyond your standard Professional Development session in a way that I think will make a big impact in schools still on the leaning curve towards true 21st Century Learning.The 21st Century Fluency Institutes Crockett describes here is based on workshops that are follwed up with months of collaborative support freom their team to embed their innovative practices into your school’s way of being. It is far more beneficial to a day of keynotes and hour long workshops that we come back from excited but then lose the impact of as time goes by and we are disconnected from the experts. Its a great PD model that I hope is adopted by others. Watch the video, visit their website and hopefully get engaged and involved. Our students deserve the chance. Who’s running Quality Control and Fact Checking in a Tech Rich, Differentiated, Personalised Classroom? It was definitely much easier to teach in the ‘olden days’. Everyone read the same text, researched the same topic, wrote the same text type, answered the same question. The students worked hard, studied and took and passed ( apparently everyone did if you listen to the nostalgic educators and parents of times gone by) the same test. Then along came this pesky new age world of personalising and differentiating teaching and learning with its notion of student choice and planning for a wide range of student interests and abilities. Along with it came a whole lot of challenges for teachers as they passed topic selection into the hands of the children. No longer does the teacher have access to all knowledge being learned during the unit of work. No longer does the teacher have complete mastery over the content of the class novel. In a single Inquiry Unit, there may be 15 different topics being explored by your class. If your class runs Literature Circles or Book Clubs, there may be 5 or more novels being read concurrently. In these instances, how much is expected of the class teacher to be on top of all the content involved in the individual student’s choice? At first glance, teachers may point to the fact that today’s curriculum is not about content knowledge any more. It’s about skill development, creativity, collaboration and communication. At a simplistic level, that may be partly true. We can’t escape the fact, though, that accuracy and understanding is still paramount. While an 8 year old will survive making the odd misinterpretation or copying the wrong information down, a 20 year old medical student can’t be confusing a pharynx with a larynx or thinking a 3:4 ratio means 3/4 and 1/4. So the question needs to be asked – How well are we dealing with Quality Control and Fact Checking in the Differentiated, Personalised Classroom? This one question brings up a whole lot more questions that every teacher needs t0 consider. Are we expecting students to provide evidence for every fact they state in a report (and are we checking them)? In the days of one topic/one book, the teacher had the source of the information and could quickly determine the accuracy of the student’s statements. We knew everything we needed to know about the plot, characters and themes of the class novel. We taught them how to write a bibliography and footnotes whether they really needed to or not. A bibliography is not enough today. We need to expect digital literacy skills like hyperlinking and bookmarking to be part of a digital report so that as teachers we can check not only that the information is accurate as we read it but also that it hasn’t just been rewritten or copied. Are we putting more emphasis on the presentation and not enough on the content? In the name of engagement, teachers ( with me leading the charge!) are exposing students to a myriad of great web tools for presenting their work. Do we sometimes get seduced by the magic of a Prezi, Glog or Voki and reward the students for how their presentation looked rather than the quality/depth of the information presented? 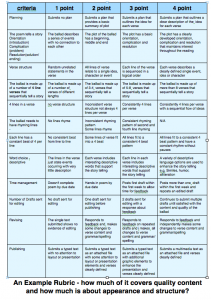 Do our assessment rubrics give enough credit for the accuracy, depth and understanding of the information or are these factors downplayed at the expense of grammar, text structure, presentation and checklist of what requirements were met? During the research phase, do we spend enough time checking that the information collected by students is relevant and accurate or do we spend all our time giving feedback on the quality of questions, time management and selection of ICT tools for presentation? Do we check for understanding of the references they use to research their topic? We need to expect more than just copying notes. The students should be summarising the notes, writing questions about the information they have found, listing what addtional information is still required from other sources. This takes time to develop in students but it’s important for developing real critical thinking. Just rewriting notes in a different sentence doesnt show enough understanding. Do we feedback about the quality of the references, the relevance of the information? How much attention do we pay to the student’s ability to record notes that support the investigation? Do we spend time checking that they are identifying enough details from a text? Too often students will highlight random sections of text to show they have found some key words but ignore major details within the same paragraph. Utilising a web tool like the social bookmarking site Diigo, we as teachers can collaboratively support students in highlighting key ideas. The tool supports sharing an online text AND annotations, highlighting and comments in real time. This is an improvement on waiting until the end of the week to hand up work to the teacher for checking. In the digital literacy environment, we can be more timely and strategic in our feedback while also checking the references being used. Are we expecting our students to prove they have fact checked their own research by referring to several sources for each key idea or fact? We often criticise the use of Wikipedia because of its crowdsourced information but don’t question other references’ validity. We need to ensure that we have taught our students to check for the credentials of the source, ( .org/.edu/gov vs .com, blog vs scholarly), how up to date the information is, how to cross reference multiple sources. Again, digital literacy skills like hyperlinking to the source within their text for instant verification puts the onus on the student to prove their information is correct. Do we encourage collaboration as a way to check for quality and accuracy? We need to consider the role of wikis, social networking sites like Edmodo and Twitter and blogs in crowdsourcing support in checking each other’s work. Maybe we need to rethink the idea that we only go public with finished products/published work. Why can’t we post drafts and brainstorms on our blogs and put it out there for others to critique, check, support, add to, fact check? Why not tweet out ideas to a worldwide audience to get feedback or answers. Following experts on Twitter could get you the support you need. One example I’ve seen is Dr Karl Kruszelnicki from Australia, a media savvy scientist who often answers tweets sent to him. I’ve read teacher blogs mentioning how they have organised other teachers via Twitter to mentor students in their grade. There is no going back to the old way of teaching. Differentiation and Personalised Learning is here to stay. And so it should be. However, we do need to make sure we have measures in place to ensure we are monitoring the quality and accuracy of the information our students present in their projects. Many teachers can find this a challenge. It’s probably more of a challenge in Primary schools where teachers tend to be generalists who teach every subject. It’s a lot to expect them to be on top of the information in Science, History, Health, Economics, Geography, Technology and Environmental Studies on top of every novel the students are reading. So we have to efficient in checking in on students at all stages of their research, not just at the presentation stage. What challenges do you have in monitoring your students’ personalised learning? What processes do you have in place to manage? I am interested in your experiences. Join the conversation. Who should we consult about technology in our schools? Nonprofit Project Tomorrow aims to make student voices heard in education. Speak Up, an initiative of Project Tomorrow, surveyed 294,399 students, 35,525 teachers, 42,267 parents, and others in fall 2010 to determine the benefits of certain types and uses of technology for teaching and learning. The results are depicted in the infographic below. I think we can learn a lot from the results of this very extensive survey. On reflection, I wonder why we do things so differently to the rest of our society. Politicians, businesses, the entertainment industry, sports organisations spend up big on researching the stakeholders in their product or idea or policy. Education departments and schools too often make the mistake of deciding what is best without asking the real stakeholders in our system what their opinions are, often to the detriment of what follows. What I really appreciate about this survey is that it focuses on ALL THREE ( I’m not including the bureaucratic side ) interested parties in education – Students, Parents and Teachers. While I haven’t seen the actual survey, this infographic suggests that in-depth questioning took place and the results encourage a lot of thinking about how we should go forward in planning for technology in schools. It also raises questions about what we as educators consider important as opposed to the parents and students think. Finally, it would also be interesting to conduct this same survey two years on in 2012, when the use of technology has accelerated so much, to see if there has been significant change in perceptions. I found it interesting that the factors that scored highest involved independent activity. Students find tech beneficial in organizing their times, managing their own learning and working at their own pace. With the push towards student centered learning, this shows technology can contribute to the success of this learning strategy in the eyes of those that count – the students. It’s also an eye opener that well less than half of the students surveyed find tech as motivating or the key to easy success. This is a cautionary tale for those tech advocates ( me included ) who think that iPads, 1:1 programs and web tools are the answer to all engagement and learning problems. We need to balance our thirst for tech spending with reflection on multiple intelligences and learning styles research that stresses students have different preferences. Technology is not necessarily the answer for all students. Another observation that comes to mind is that we have work to do on some of the skills we want to ingrain in the learning behaviors of our students. Collaboration and asking questions are important but the survey suggests our students are not necessarily using tech effectively for that, despite all the great collaborative, sharing, networking tools at our disposal. 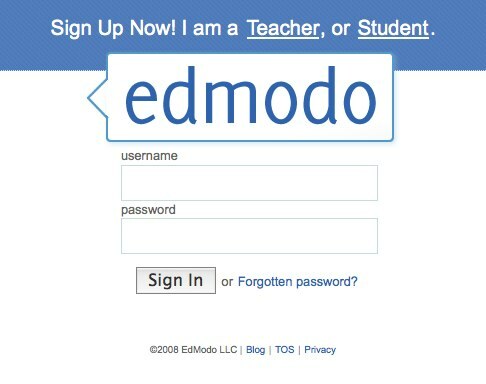 It brings home the point that its not enough to introduce Edmodo, Diigo, blogging and the like to the students and expect it to just happen. We have to work hard to show them how it will improve their learning. Obviously, we also need to do the same for teachers, parents and leadership as well. I was particularly interested in this section of the infographic. Parents are often the last people we consult when we make decisions. They are often the first we get concerned about though when they start to question our decisions or pedagogies. Maybe we should communicate more with them and find out what they want. Then we can address the issues they raise and educate them in what we believe from our training and experience is best for their children. What interested me most from the survey results in the infographic was the motivation behind the parent responses to what can help them assist their children in their learning. They want access to curriculum materials so they can support their kids. How often have we heard ” I can’t help my son because you do it differently to when I was at school.”? Technology today gives us the perfect tool for sharing what we do in school with the parents. Blogs, social networking sites, video lessons ( only 22% in this survey – before the flipping classroom boom – but it would be interesting to find out what the interest would be now ), online newsletters are practical ways to communicate how we teach the students in a contemporary classroom. It’s encouraging to see such large percentages of parents wanting regular updates and viewing of children’s work. They don’t want to wait for reports or interviews or portfolios to come home at the end of term. They want technology to provide them access. This is a huge challenge for us as schools as we are not used to parents seeing the students work before its “ready”. There needs to be a shift in thinking about what this access to students work will entail. Parent and teacher education ( and students too) will be needed so there isn’t a misunderstanding of the difference between work in progress and published work. Technology has the potential to allow for real partnerships between all the stakeholders in a child’s education. From this survey parents want to be a part of it. We just need to make sure we get the balance right in the partnership. Another fascinating tidbit from the infographic was the response to purchasing tech for students to use at school. Without knowing the demographics of the survey, it’s enlightening to see such a large percentage of parents willing to buy mobile devices for their children to use AT SCHOOL. 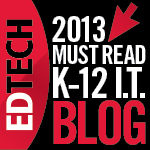 It raises the weighty issue of BYOD ( bring your own device ) programs in schools. To me, this suggests there needs to be serious discussion between school and parents about the prospects rather than just dismissing the idea. Of course, just because parents might think it’s a great idea, doesn’t mean it is. Many parents aren’t necessarily in control of the tech use of their children and don’t understand the pitfalls of such a program. Again, it means Parent Education in responsible digital citizenship, their responsibilities and how they can support their children will be needed but if they are prepared to make the commitment the discussion needs to be had. Some telling observations can be made from the results in this part of the infographic. First, it is apparent that digital literacy is not clear to either teacher or students in some cases, particularly in analyzing, interpreting and detecting bias in media stories. It suggests we need to have a conversation about new Literacies with our teachers and why technology has an important role to play in this. Not surprisingly, students don’t place importance on checking their sources. This is a big part of digital literacy – the more children are using the Internet for both research and presenting their findings in a public forum, the more we have to change their behavior. They are exposed to so much info in such easily accessible and unchecked ways, we have to place importance on convincing them this is important. We think of them as ‘digital natives’ but they’re still not skilled in the nuances of its use. We have to consult teachers, parents and the students themselves in this area. One final observation here is the low percentage for producing digital media reports from both teachers and students. Again, a lot has changed in the last two years since this survey in the proliferation of web tools in schools. Nevertheless, less than one in three teachers and only 40% of students thinking digital publishing is important is interesting to consider. This is one area I would really like to investigate at the local level before making massive investments in technology. It seems to be accepted that we need to invest in technology on a large scale to prepare our students for the tech rich world they are going to be living in. Before making this investment though, it seems to me we need to make sure we consult with everyone involved. A lot of time, effort and most of all money can be wasted if we don’t find out what our clientele wants. That’s teachers, students and parents. Decision makers need to consider all stakeholders. When you look at the numbers of people involved in this survey, its hard to ignore the importance of the responses received. I would love schools to conduct a similar survey to find out what everyone involved thinks. It would allow for considered decisions to be made rather than hasty purchases. What do you think? Addressing the needs of all students in your Maths Classroom can be a real challenge. Do we stream based on ability? Do we use collaborative mixed ability groups? What’s the role of rich,open ended questions and differentiated curriculum? How do we pitch to the middle 50% but still cater for the upper AND lower 25%? It’s a challenge I’ve been grappling with for 25 years. Recently, I’ve been considering the use of Edmodo to provide access to extension and enrichment Mathematics opportunities for the more able students in the classroom. ( For those unfamiliar with Edmodo, click here for a description) This is my plan. I would be interested in feedback on its potential effectiveness before going further with it. This is not a simple task. The standard method these days seems to be the standardized test. In Australia, we have NAPLAN, the yearly national assessment task targeting Years 3,5,7 and 9. Debating its merits here is not my intention today. I see its usefulness in quick identification of the higher achievers in a current group of students. I would then administer the next level test to these able students to gauge how far their abilities extend beyond the current class level. For example, after selecting a group in Grade 6 based on Grade 5 results from the previous year, I would give them the Year 7 test. Using data analysis, I’d identify their strengths and learning needs for future programming and targeted areas for extension and enrichment. This would only be a starting point. Standardized tests are a narrow form of assessment that don’t necessarily identify fully the student’s need for extension in Mathematics. I’d continue to evaluate the children within and outside the extension group. I’m sure during the year I would identify children who could join the group for extension in specific areas they excel in. The beauty of using an open, collaborative, independent learning platform like Edmodo is that students can opt in and out of specific tasks or units of work. This is how I envisage setting up and running an Extension Program in Mathematics within the standard classroom environment. First I would set up a Maths group for every student in the class. I wouldn’t want the Extension group to stand out from the crowd by having sole access to Edmodo for Maths. I would use this area to post problem solving tasks that the whole class could engage with, links to quality Maths sites that students could use to consolidate understanding in current units and revise past lessons as well. I would provide opportunities for discussion of strategies used, allow children to share their understanding, ask questions that both teachers and students could answer and share with the class. I’d allow for the possibility of using iPad apps like ShowMe or Explain Everything to post audiovisual explanations or lessons created by teachers or lessons. I would also post resources children could access to support them while working independently. 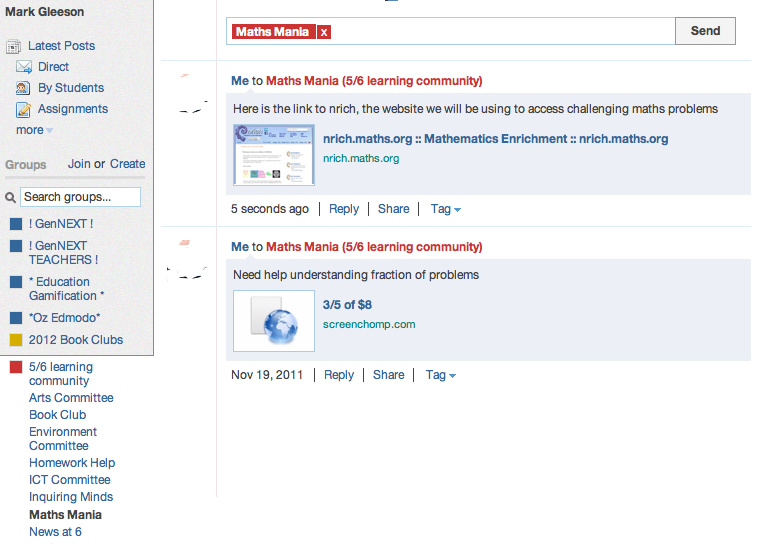 The extension group could have a lead part in sharing their expertise with other classmates in this main Edmodo group. they could even create their own mini “Khan Academy”. 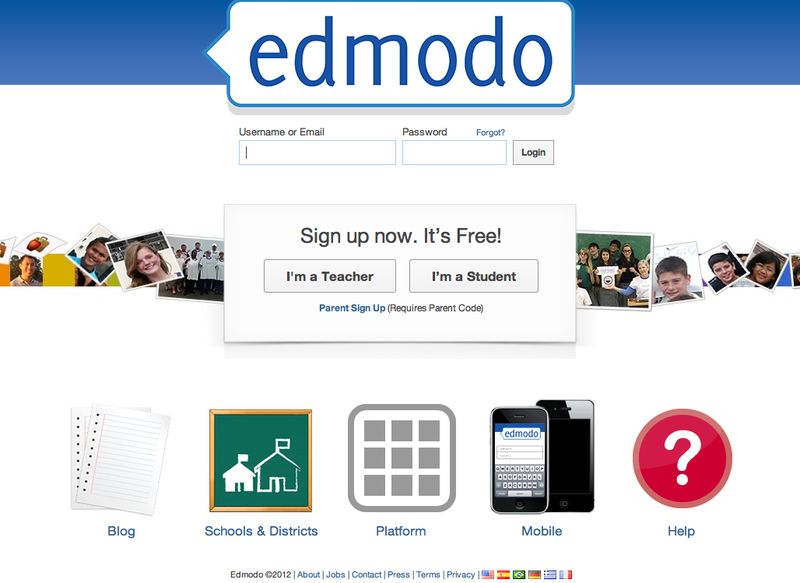 I would then create a subgroup within the main Edmodo group for my Extension/Enrichment group. I envisage this group being formed from able students across all classes in a particular grade level, possibly across several if there are able students in lower Grade levels who could qualify. I would plan for this group to access materials and concepts beyond what is available to the main group but accessible through the same platform as everyone else. Obviously there would need to be some significant planning and negotiation with all class teachers to ensure this worked within their programs. consideration would have to be made about how these students would participate in both the extension sessions and regular class lessons. I see this happening in a number of ways. Option 1. The students begin the lesson with the rest of the class. When they have received enough instruction on what is expected of them, they move on to completing required work for their class teacher independently, leaving their teacher to work with those who need support. When they complete the set task, they submit it on Edmodo through the assignment section and then enter their Edmodo Extension Sub group to collaborate on the higher level tasks assigned by me. They communicate with each other either personally if in the same grade or via posting their strategies, solutions, suggestions, questions, comments on Edmodo for the rest of the Extension group to respond to. Their work will be completed digitally and submitted through the Assignments section of Edmodo so that I can feedback and collaborate with them on the tasks. Option 2. Alternatively, for one session a week, the group would meet with me and work on high level problem solving tasks and extension work related to the unit of work their class in currently involved in. Using online enrichment programs like the website nrich, the group would be collaborating on problems, sharing their possible solutions and strategies not only with each other but by submitting group or individual solutions on the nrich site for other like minded students to collaborate on through global forums. I envisage opportunities for the students to use technology such as screen casting computer programs or iPad apps I previously mentioned like ShowMe to record their solutions and strategies audio visually. Using a site like nrich, which would allow them to self select problems to solve would give them the freedom to challenge themselves both individually and in teams. It would also give them the option to opt in and out to return back to their class if they choose to. Option 3. A third model could be a choice of making daily decisions to complete regular class work as homework and deciding to work in their extension groups or individually on Edmodo on a daily basis. 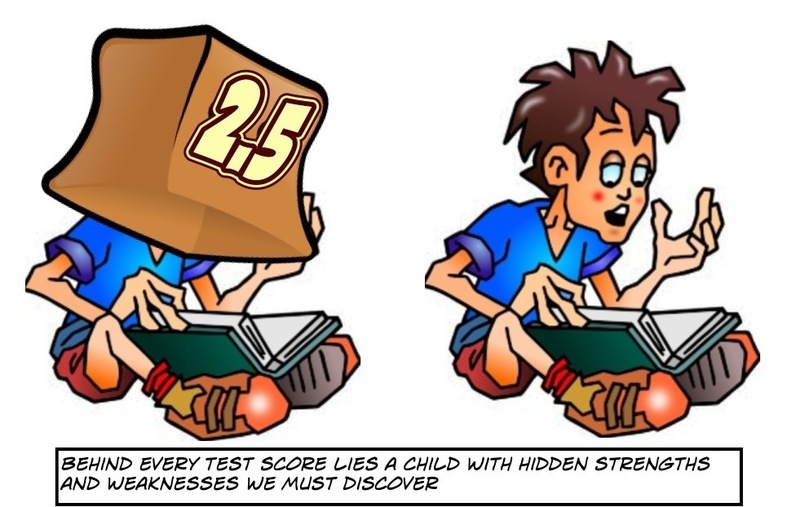 As their test results would have already indicated in being selected for the program, they have most likely mastered the skills being taught in the regular class program and a simple completion of the tasks for homework would satisfy their class teacher’s need for evidence they have understood that area so they can report on it later in the year. This option fits a Personalized Learning model commonly encouraged in today’s schools and would allow the student to remain engaged in Maths at or beyond their level rather than going through the motions of completing simple tasks. All links to nrich and teacher/student created work would be posted on Edmodo, with individual entries tagged or saved in libraries so that students could always have easy access to the tasks. The collaborative nature of leaving instant comments and feedback allows the group to stay in contact with each other outside of school to continue their problem solving together. This could become engaging homework, with the teacher able to remain in contact and feedback on the work they post on Edmodo. Each member of the group can work on their own problem solving and submit it to me or their teacher independently of the group for personal feedback before sharing with group if they choose to. The function of the Assignment process in Edmodo allows for children to receive private feedback and allow the teachers to collect, collate and mark each submission, enabling effective assessment to occur at all points in the program. 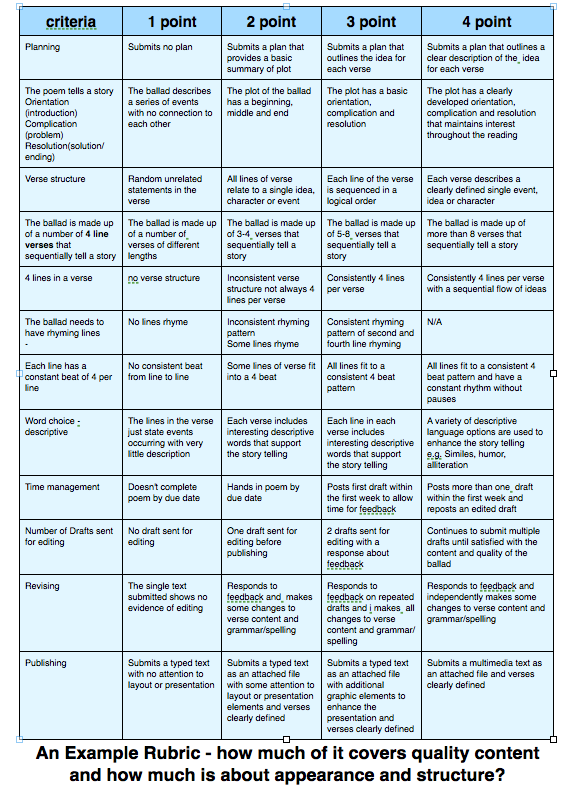 Teachers can submit rubrics and criteria for marking the work on Edmodo so the students know what is expected of them. I have had success with such use last year working with a Literature Circle group. 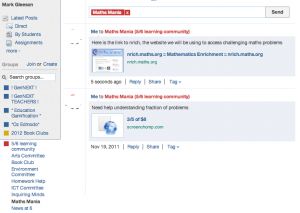 The fact that all students from the classes are also using Edmodo for their Math work as well means that all students can easily be given the opportunity to opt in to or out of the Extension group at any time without any extra planning or organisation by the teachers. I think this would be an important option as it would encourage other students to take on the challenge of extension tasks if they choose to. Other teachers can be given co teacher status and become involved in the program, either as observers or contributors. This would allow for professional feedback on the suitability and effectiveness of the program. These are my initial thoughts and obviously this kind of radical change to the status quo of primary schools as I have experienced them would involve leadership, class teacher, parent and student discussion. I need to think through this more and would appreciate feedback from others on how they have managed the needs of the more able students in their classrooms. I would really appreciate readers leaving a comment and contributing to the conversation of extending and enriching the learning of the able mathematician.